Apple is consistently looking to introduce new devices, such as iPhones and iPads, that ship with increasingly innovative integrated technology and feature sets. In addition to introducing new features through software updates, the Cupertino-based company – like many other manufacturers for that matter – continuously tries to push forward the hardware it releases with new additions. Users undeniably appreciate this type of attempted progression, but even though they love to see new and improved hardware landing on the shelves with each generational release, there’s always one thing that is consistently on their mind; the received battery life on the device. Battery Percentage is a free-of-charge app on the App Store that gives you additional insight into exactly that. 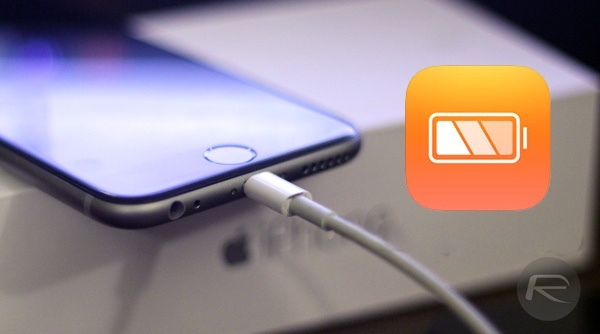 It’s especially useful for checking battery charge cycle count of your iOS device. While there has been a number of jailbreak tweaks in the past that has provided such low-level hardware info, the best thing about this is that now it’s all packaged and made available in an app form on the App Store, means there’s now no jailbreak required to get this type of details on iOS. One thing that instantly jumps out with this app though is that not a great deal of time, energy or resources have been applied to the user-experience or user-interface. That’s not to say it’s particularly bad, but it hasn’t really been designed well either, functioning as more of a collection of information on a display surrounded by white space. Some will love the simplicity. Others will hate the laziness. Those who hate it may be swayed by the fact that they can instantly see the current capacity of the internal battery, as well as the health of the battery. This immediately educates the user on whether or not the battery is capable of holding a 100% charge or if it has lost capacity over time. Additional information includes how many charge cycles the battery has been through, the current operating temperature of the cell, and the discharge current, if that sort of thing is appealing to you. In addition to attention being paid to the battery, the developer has also included a set of hardware checking features, which include checking the health of the GPU, CPU, Storage and network components. One thing that is immediately apparent on most smartphones is that the manufacturer, whether it be Apple, Samsung or similar, provides very little insight into what is actually going on with the battery in the device. Sure, we get a very simple graphical overview of how much battery is left, or when it’s actually going through a charge cycle, but other than that the information is largely abstracted away from the end-user. 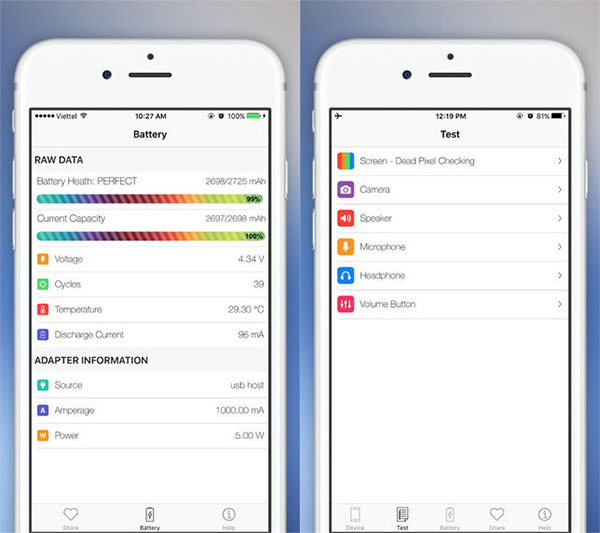 Tran Manh Quan’s Battery Percentage app looks to change that by giving additional insight into battery health, device status, and even the phone’s charger – all for free. You may want to grab it as soon as possible, though, given the kind of low-level hardware details the app provides, Apple may pull it from the App Store soon. Yeah but it crashes on jailbroken phones something on similar lines with battery life. Interesting.. You hate Apple but you used it ? Confusion. LOL! The last time I checked you said Jailbreak rules but now you are crying about an app crashes on your jailbroken iPhone. It seems you’ve overruled. I don’t see this lasting long grab it while you can. can’t download app.. it’s for Romania app store..
Shows no useful info (only zeros) on iPhone 6s running iOS 10 Beta 8. Same here. Also why does the app want access to your Photos and Music? It has a couple other test utilities for testing the screen, speaker, camera, etc. — you don’t need to allow access if you don’t need to use any of those other tools and just want the battery info — however, OP is right, iOS 10 support is lacking. I think the author is working on updating it for iOS 10 right now. How is it helping anyone? Works great on my 6s+ iOS 10.2 and Ipad air2. Seeing what the amperage is of my different chargers is neat. Charge cycles are now gone with iOS 10 unless the dev can update it. Was one of my favorite features too.